Welcome back to part 2 of the Bezel series. The Spellbinders® Media Mixáge™ bezels are very versatile. Today I’m showing you how to use a medium you might not otherwise think about. Cool2Cast is a fiber plaster that, when mixed with water, becomes a pourable medium. It sets quickly and it’s paintable. That means you have a virtual blank canvas on which you can do so many things. To make it easy though, I decorated the surface with outline stickers and colored them in with Copic markers. How will you decorate your bezels? Please take a moment to share your comments and suggestions! Love Cool2Cast? I DO TOO! 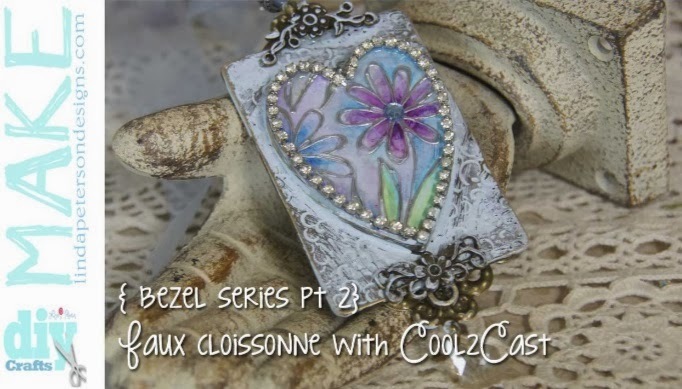 More Cool2Cast ideas on Tiffany Windsor’s Cool2Craft Youtube Channel – Click here and check out her website too! Note: While I used Pendant blanks from Spellbinders (my favorite) , this project will work with any bezels you may already have. Acrylic paint – I used a pale blue, but an off white color will work well. Note: With a few small substitutions you can create a variety of looks with this technique. Our newest line from A Guilded Life offers a variety of complimentary charms and bezels. The GL1-001S Regal Wreath or even the GL2-001 Heart Angel would be nice compliments to the design. This technique works with any of the Spellbinders Media Mixage bezels as well as the A Guilded life bezels. Keep several bezels ready and pour excess plaster into them so you have something to play with in the future. Explore! Mix Cool2Cast according to directions. Pour inside of bezel and let dry – about an hour. Basecoat bezel with acrylic paint. Let dry and sand away edges to distress. Apply a thin layer of decoupage medium to seal. Blend colors with a small brush and a bit of rubbing alcohol. Attach cording to pendant with jump rings. Attach toggle clasp. Glue on embellishments as desired and attach dangle to bottom with jump rings.